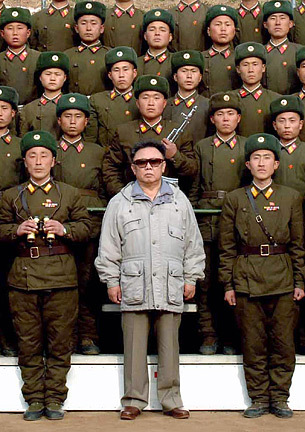 North Korean leader Kim Jong Il poses for a photograph with the soldiers of the Korean People's Army 821 unit, at an undisclosed area in North Korea. VIRTUALLY EVERY statement issued in response to North Korea's apparent first-ever nuclear weapons test has included an admonition (or plea) for Pyongyang to return to the moribund six-party talks. But are all parties prepared to take "yes" for an answer? Pyongyang's response, to date, has been to steadfastly refuse to come back to the negotiation table, insisting that the United States first end its "hostile attitude" toward North Korea, to include the lifting of current "financial sanctions" imposed in response to Pyongyang's widely recognized money laundering and counterfeiting operations. But what if Pyongyang suddenly reverses course (as it is sometimes inclined to do) and declares that it is prepared to return to the talks, provided that the United States and the others (Japan, South Korea, China and Russia) deal with it as a full-fledged member of the nuclear club? Washington's position on this already is clear: North Korea "can have a future or it can have these weapons. It cannot have both," Assistant Secretary of State Christopher R. Hill remarked prior to the test. "We are not going to live with a nuclear North Korea, we are not going to accept it." Seoul and Tokyo also have said quite explicitly that they "will not tolerate" a nuclear-armed North Korea. Even Beijing and Moscow have been refreshingly firm in condemning North Korea's test. So what's there to talk about? The time has come for "six minus one" talks, aimed at dealing with North Korea's most recent provocation. Pyongyang should be invited to come, provided it agrees in advance that it will take no further steps down the nuclear path and understands that the first topic of business at the new talks will be bringing about the verifiable denuclearization of the Korean Peninsula, as called for in the Sept. 19 Six-Party Talks Joint Statement. But it should be made clear that the talks will proceed, with or without North Korea's presence. The time also has come to speak about the unspeakable; namely, the need for regime change in North Korea. Not regime change as an immediate military (or even political) objective, but as the only realistic alternative to a continued North Korea refusal to end its nuclear weapons program. The alternative -- an unrealistic one -- is accepting North Korea as a nuclear weapons state, which would set a dangerous new precedent -- or, more accurately, perpetuate the precedent established when India and Pakistan joined the nuclear club in 1998 -- and would be extremely destabilizing, both regionally and globally. Tehran obviously is closely watching the outcome. If you ask 10 "experts" on North Korea a question, you are likely to get 12 different answers; they seldom agree even with themselves, much less with anyone else -- except on one point: All agree that Kim Jong Il's first priority is regime, which in his case means personal, survival. Until the international community takes actions that the "Dear Leader" perceives as directly threatening his own survival, he is unlikely to be persuaded by idle threats or even by selective sanctions. What's needed now is a clearly articulated containment policy that is aimed at either ending North Korea's nuclear weapons program or ending the regime that will not halt this dangerous drive. This does not mean marching on Pyongyang or conducting pre-emptive strikes -- the targets are less than obvious, other than the Dear Leader himself (and he is an elusive target); no one knows where the plutonium and any potential bombs are hidden and striking nuclear reactors runs the risk of radiation pollution. It does mean cutting off political and economic contact that clearly benefits the North (such as South Korea's Kaesong Industrial Zone project) and strict monitoring of humanitarian assistance under U.N. auspices and a firm, unified international response that North Korea is not welcome back to the table until the regime changes its mind or others in North Korea, with as much outside help as is possible, change the regime. INTERNAL ACTIONS spurred on in part by years of outside pressure brought about regime change in Moscow and the eventual fall of the Berlin Wall. It also brought about today's China. Those like me who have been admonishing Pyongyang to follow the "Beijing model" of opening up and economic reform tend to forget that this was made possible in China only through regime change: the removal of the so-called "gang of four" by Deng Xiaoping. If Kim Jong Il hasn't proven anything else, he has certainly proven that he's no Deng Xiaoping. Pyongyang for years has been accusing the Bush administration of pursuing a regime change policy, despite Washington's continued expressed willingness to deal with the current regime, albeit only in a multilateral forum, in which bilateral talks remain possible. It's time to acknowledge that regime change is an alternative, and perhaps the only policy left to pursue if Pyongyang will not honor its own pledges to denuclearize. A firm policy of containment, with credible, meaning enforceable and enforced, political and economic sanctions, is the best option for compelling Kim to reverse his policies, or to persuade others among the North Korean elite to change their leader. It also will ensure that whatever nuclear weapons capabilities currently exist in North Korea remain there and are not exported into the hands of al-Qaida or others, while hopefully dissuading other nuclear aspirants from pursuing a similar course. Ralph A. Cossa is president of the Pacific Forum CSIS, a Honolulu-based nonprofit research institute, and senior editor of Comparative Connections. » Rail or a real solution?